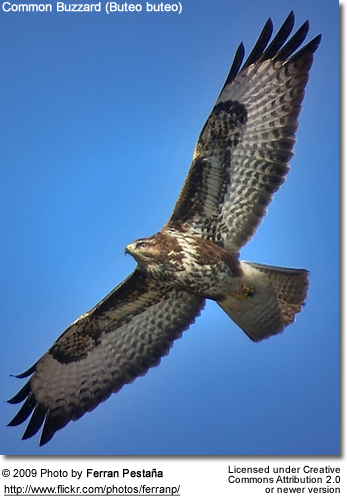 The Common Buzzard (Buteo buteo) is a medium to large bird of prey, whose range covers most of Europe and extends into Asia. There are around 40,000 breeding pairs in Britain. It is usually resident all year except in the coldest parts of its range, and in the case of one subspecies. 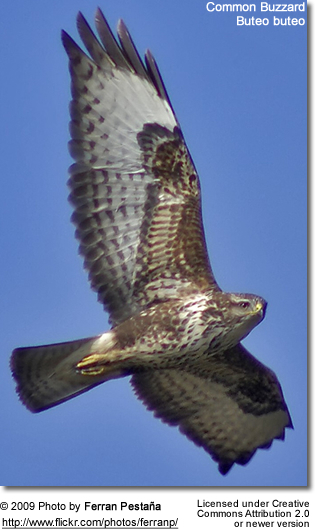 Buzzards do not normally form flocks, but several may be seen together on migration or in good habitat. The Victorian writer on Dartmoor, William Crossing, noted that he had on occasions seen flocks of 15 or more at some places. Though a rare occurrence as many as 20 buzzards can been spotted in one field area, approx 30 meters apart, so cannot be classed as a flock in the general term, consisting of those males (and females) without a mate or territory. They are fiercely territorial, and, though rare, fights do break out if one strays on another pair's territory, but dominant displays of aggression will normally see off the interloper. It breeds in woodland, usually on the fringes, but favours hunting over open land. It eats mainly small mammals, and will come to carrion. A great opportunist, it adapts well to a varied diet of pheasant, rabbit, other small mammals, snakes and lizards and can often be seen walking over recently ploughed fields looking for worms and insects. Pairs mate for life. To attract a mate (or impress his existing mate) the male performs a ritual aerial display before the beginning of Spring. This spectacular display is known as 'the roller coaster'. He will rise high up in the sky, to turn and plummet downward, in a spiral, twisting and turning as he comes down. To then rise immediately upward to repeat the exercise. 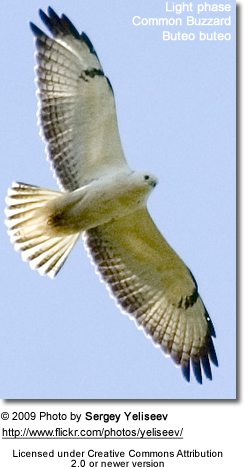 It is typically between 51-57 cm in length with a 110 to 130 cm (48-60 inch) wingspan, making it a medium-sized raptor. This broad-winged raptor has a wide variety of plumages, and in Europe can be confused with the similar Rough-legged Buzzard (Buteo lagopus) and the only distantly related Honey Buzzard (Pernis apivorus), which mimics the Common Buzzard's plumage for a degree of protection from Goshawks. The plumage can vary in Britain from almost pure white to black, but is usually shades of brown, with a pale 'necklace' of feathers. 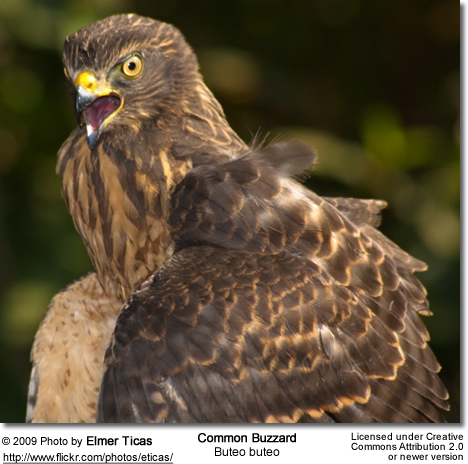 This species was first described by Linnaeus in his Systema naturae in 1758 as Falco buteo. 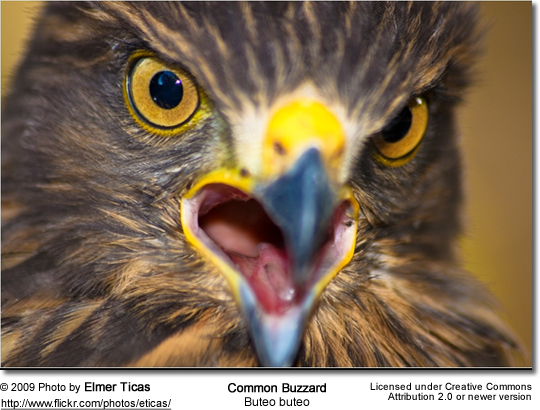 The Forest Buzzard, B. (b.) trizonatus, is another form sometimes upgraded to a full species. This is a resident breeding species in woodlands in southern and eastern South Africa. It is very similar to the abundant summer migrant Steppe Buzzard, but the adult can be distinguished with a good view by its whiter underparts and unbarred flanks. 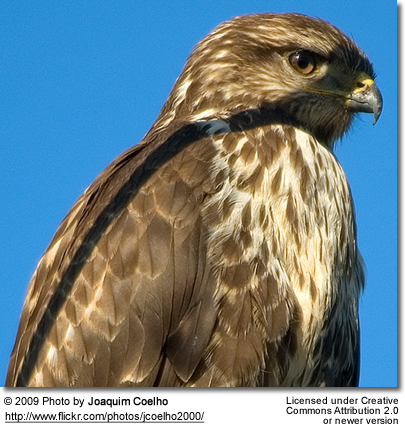 The Juvenile differs from the same-age Steppe Buzzard by its white front and tear-shaped flank streaks. 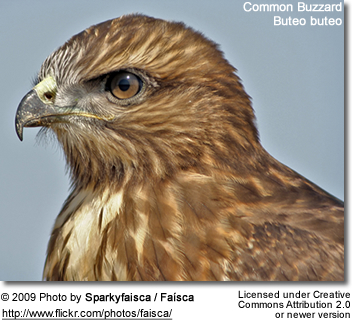 Forest Buzzard, as its name implies, is a species of evergreen woodlands including introduced eucalyptus and pines, whereas Steppe Buzzard prefers more open habitats. However, habitat alone is not a good indicator for these forms.